At Vesta, we feel a key element to our success includes ensuring the safety and well being of our employees, business partners, community and customers. It is our policy to establish safe working conditions and operating practices that will safeguard everyone. Safety is at the forefront of our operations through proactive measures with respect to federal and state regulations and implementation of policies that promote a culture of safe practices. Please click on a link below to learn more. Vesta owns and operates natural gas pipeline systems which may be situated in your area. The systems operated by Vesta are classified as gathering systems which typically involve pipe that operate at lower pressures than transmission systems. The location and function of gathering pipelines is to receive producing natural gas at the wellhead and carry the unprocessed “raw” gas to processing facilities, where impurities and natural gas liquids like propane, butane and natural gasoline are extracted. Larger transmission pipelines move the processed gas to market, where it’s ultimately consumed and delivered to homes and businesses to provide heat and facilitate manufacturing. Since most pipelines are buried, the general location of any pipeline can be determined by looking for pipeline markers. These markers should never be used as a reference for a pipeline’s exact location. The markers or signs may contain the name of the commodity, name of the operator and a contact number in the event of an emergency. If a leak should occur on the pipeline, some of the materials being transported could cause environmental damage. Other products may be highly flammable, or harmful if inhaled, cause eye or skin irritation, and difficulty breathing. 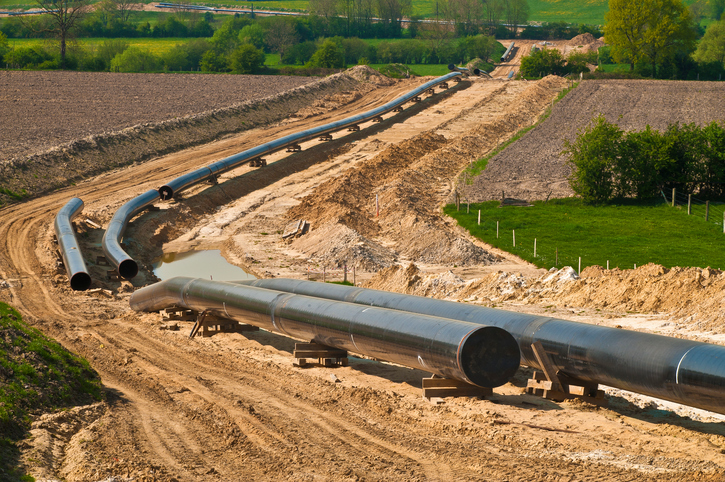 Because of these potential hazards it is important to be able to detect a pipeline leak. Do not use a cell phone or other electronic devices near the suspected emergency area. Avoid direct contact with the escaping gas or liquids. Avoid creating sparks or sources of heat which could cause the gas or other product to ignite. If you fine yourself in a suspected gaseous area, DO NOT light a match, start an engine, or even switch on an electric light. If you suspect the problem is with a Vesta pipeline, immediately call our toll-free, 24 hour emergency number, 1-833-476-2267, from a safe location. The pipeline operator’s name and emergency telephone number can also be found on the nearby pipeline marker. If you do not know who to call, call your local fire, police, sheriff’s department, or state police. Advise them of the nature of the emergency and its location. Right-of-ways (ROW) are necessary for pipeline operators to respond to pipeline emergencies, eliminate third-party damage, provide ROW surveillance, perform routine maintenance and federal/state required inspections. It is important to keep buildings, fences, structures and landscaping away from these ROWs. Encroachment upon the pipeline ROW inhibit the pipeline operators from performing necessary tasks and responding to any pipeline emergencies. If minor damage to a pipeline or its protective coating were to occur, please immediately notify the pipeline company. Even a small disturbance to a pipeline may cause a future leak. A gouge, scrape, dent or crease is cause enough for the company to inspect the damage and make repairs. All damages to underground gas or hazardous liquid pipeline facilities are required by law to be reported to the operator. Excavators must notify the pipeline company immediately upon damage. Colored flags are placed in the ground to temporarily identify the various types of buried utilities, or to indicate planned excavation activity. It is important not to remove or relocate these flags as it could lead to possible danger for yourself and others living and working in proximity. 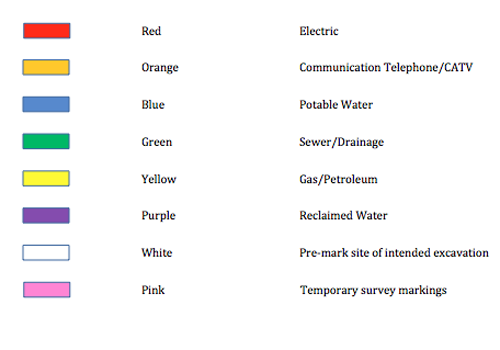 The following chart is a reference guide in designating the type and use of underground facilities or planned excavation. Emergency Responders who are well-informed about the hazards and risks of pipeline operations are better able to act promptly to protect life, property and the environment. Pipelines contain flammable, hazardous and even deadly petroleum gases, liquids, and other chemical products that present emergency responders with a multitude of hazards and risks that vary depending on the topography, weather, and properties of the material involved. Firefighters, Police, and EMTs are the first to arrive at the scene of an emergency. If a pipeline hazard is present, we want to ensure that first responders are prepared to respond safely to these potentially dangerous situations. The first and most important priority for Emergency Responders is public safety and environmental protection. Park vehicles a safe distance from the incident and turn off engines. Approach the incident from upwind, uphill. Do not attempt to extinguish a natural gas pipeline fire with water or other chemicals. Use spray to protect surrounding exposure. Do no attempt to operate valves or equipment. Rely on pipeline personnel as they are trained the proper procedures. If, as a public safety or local public official, you have the opportunity to advise local businesses or facilities along the pipeline ROW on their emergency response plans, encourage them to not choose the pipeline ROW as their identified gathering point. If you are someone who possibly works, resides or conducts farming activities in proximity to a natural gas, liquid and/or crude oil pipeline(s) or gathering systems, please take the time to educate yourself with the pipeline safety information contained herein. Since most pipeline markers are buried, the general location of any pipeline can be determined by looking for pipeline markers. These markers should never be used as a reference for a pipeline’s exact location. The markers or signs may contain the name of the commodity, name of the operator and a contact number in the event of an emergency. Farmers and ranchers typically dig more dirt than anyone. Farming activities such as chisel plowing, soil sampling, post hole digging, deep ripping, leveling, trenching and other deep excavating can benefit from calling 811. Many agricultural operations could cause accidental damage to a pipeline and could lead to serious injury or death. It is critical for farmers and ranchers to follow appropriate safety measures. Excavation work, diffing or grading are the most frequent causes of pipeline damage. Whether you are planning to build a large project, erect a fence or simply landscape your property, you should protect your safety and the safety of others, because even a relatively minor excavation activity can cause damage to a pipeline, its protective casing and/or buried utility lines. Contact OKIE 811 or 1-800-522-6543, at least three business days before beginning any excavation, construction, farming or digging. Wait the required time for marking after your call. Respect the marks. Observe the color-coded flags and use fitting techniques when digging near a pipeline. Correspond with utility owners via your state’s one call center. Professional locators will mark underground utilities with flags or paint so that you can perform your work around them, saving yourself from possible injury or property damage. © 2018 Vesta Midstream, LLC. All Rights Reserved.